I loved these so much that I worried I would eat the whole tray if I left them in the house…so of to work with B they went. B recently informed me that they were proclaimed in the “all-time top three” of desserts to ever be consumed in his office…wow! It’s always nice to make something that I like, but to hear that other people like them too gives me a nice little glow inside. I used my little 2-inch tartlet forms for these. Don’t they remind you of little chocolate flowers? The ganache I used had slightly higher portion of cream to chocolate, because I wanted it to stay on the soft side when you bit into it: kind of like the inside of a chocolate truffle. Oh, and one last thought: I had a little chocolate-raspberry ganache left over, and it is really delicious heated up and poured over some ice cream, or for dipping fruit in. YUM!!! Again, I used half the recipe listed above for 24 tartlets. In the bowl of a stand mixer, use the paddle attachment to mix together the flour, cocoa, and sugar on low speed for about 1 minute. Add the butter and continue to mix on medium low speed until the pieces of butter are barely visible, about 2 to 3 minutes. Add the egg yolks and beat for another 30 seconds. Stream in the cold heavy cream and continue mixing until the dough comes together. Scrape down the sides of the bowl and continue mixing on low speed for 1 minute further. If you made the full recipe, divide the dough in half. Flatten each half (or, if you made half the recipe, the entire bowl of dough) into a disk about 1/2 inch thick and wrap it tightly in plastic wrap. Refrigerate for at least 4 hours, or overnight. Bake the tartlets for 15 minutes at 350 degrees F, until they’re a dull dark brown. Puffing shouldn’t be a problem with the small pans. Remove them from the oven and let them cool in their pans; once cool, remove them from the pans to a wire rack until you’re ready to fill them. 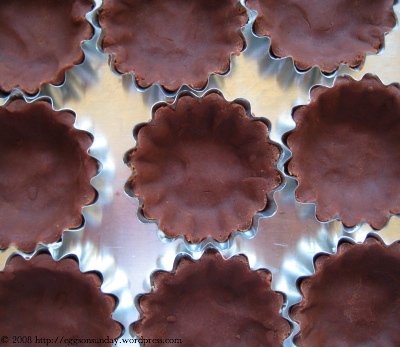 Place your chopped chocolate in a heat-proof liquid measuring cup (I used a 4-cup Pyrex liquid measure.) Whisk the cream and raspberry jam together in a small saucepan. Heat over medium-high heat until this mixture reaches a boil. Pour the hot cream mixture directly over the chocolate, and let it sit for a few minutes. Now stir the cream and chocolate mixture swiftly until the chocolate is completely melted and the mixture is smooth. Stir in the chambord. 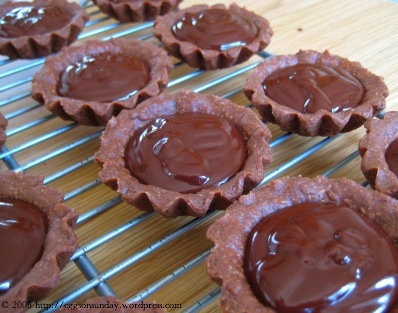 Pour ganache into each tartlet shell until it almost reaches the top. Let these cool slightly, then place a raspberry into the center of each. You can let them set up at room temperature, or place them in an airtight container in a single layer and store them in the refrigerator. Makes about 24 2-inch tartlets. So pretty and there is nothing better than raspberries and chocolate! Wonderful idea! They look beautiful! Great combination of chocolate and raspberry, and the colors, too. oh i really want a tart now. looks so yum! 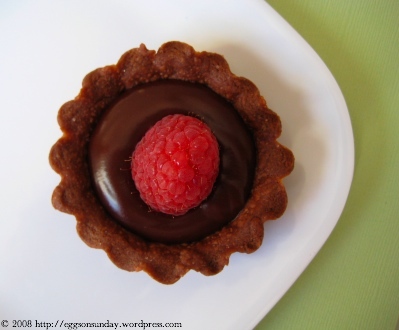 I want to go to the raspberry ganache tart parade! Those are adorable! Very cute! 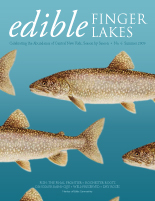 I need to get this cookbook out and use it! Yea!! I’m making these today! OMGs these look positively delectable!! I wish I had more ime to bake. I MUST have those little tart pans. Now. Raspberry + Chocolate is the way to go. Perfect combo. I want these tart pans too! Did you find them??? 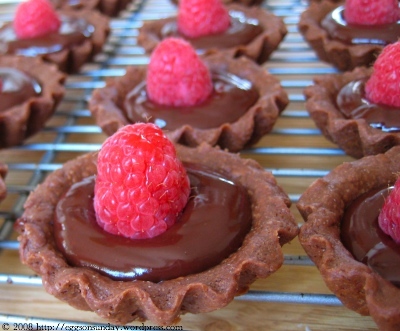 Oooooo… Raspberries and chocolate is one of my favorite combos! Gorgeous shot! I’m definitely going to give these a try – thanks for the recipe. These are adorable! I need to make some tartelets. These look too good to pass up! Oh my god, this looks like the most fantastic thing ever. I have to make these. Look wonderful! Planning a baby shower and plan on trying these for the dessert! Wondering where did you get your tartlet tins?!?! I am also looking to make these for a baby shower. I was wondering if the chocolate ganache would hold in a container overnight so I could assemble them the next day at the shower. Thanks again for sharing this recipe!